To those who know about this 'path' to the summit of Snowdon it either strikes fear into the heart or gets the adrenalin running depending on whether you like a challenge or are not good with heights! The most dangerous of the main paths, Crib Goch is the site of many accidents - many unfortunately fatal. 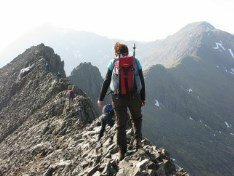 Llanberis Mountain Rescue warn quite simply 'the route up Crib Goch and along the ridge is extremely dangerous and should not be attempted by novice walkers'. Many thanks to Simon Laughton who has provided this description (and photos) of what Crib Goch is really like, and his advice on how to tackle the climb. Crib Goch (Red ridge) is an adrenaline fuelled gut wrenching scary arête of Snowdon, which is not to be undertaken lightly. Once you embark on the traverse of the ridge you cannot get off until you have reached the other side, such is the severity of the ridge. The only things that get off of the side are either mountain goats or casualties, so this is not the best of places to find out that you afraid of heights. Starting from the car park at Pen Y pass take the right hand track which is the start of the Pyg track, this the most rugged of all of the paths going up to the summit. Find places to stay near Snowdon - Click here. The path starts at Bwlch Y Moch with some large rocky steps to start you off and gradually get larger as you go, once around the corner the path splits off here, this is where you can either carry on via the Pyg track to the summit or you branch off right, over a style which takes you to the start of the 3,028ft grade 1 scramble to the top of the ridge. This is some of the best grade 1 scrambling you can get in the country, always make time to spot your path as you climb as it is difficult to go back down and around if you make a mistake. Once you are on the top of the ridge of Crib Goch, which is 3,028 ft high, keep on the left hand side as this is the safest side to traverse on. Hold on to the top as you go along as the rock is very polished and can become slippery if wet. This is the most thrilling and adrenaline pumping part of the traverse! Towards the end of Crib Goch you will come to a large rock - do not try to climb over this. You now need to go down and around and end up on the right hand side, this is another great and enjoyable scramble. Once you are around on the other side you have finished Crib Goch and are now on Crib Y Ddysgl Before you start making your way up this track stop on the saddle or col as this is a great area to take on some much needed water and food fuel for the trek ahead. Crib Y Ddysgl, although not rocky, is a hard slog up hill, make sure that you stick to the well worn paths as again there is a rather large drop if you slip. Once on top make your way to the Trig point. This is your second summit of the day Garnedd, at 3,494 ft. From here follow the train track up to your 3rd summit of the day Snowdon itself at 3,560ft. From here you can either carry on around or complete the Horse shoe, which will take a further 2 and half hours or you can choose from 5 different paths to descend - both the Miners Path and Pyg Track will take you back to your starting point at Pen Y pass. If you choose the other tracks you can catch the Sherpa bus at the bottom which will take you back to the car park or youth hostel. Important notes for attempting Crib Goch - This is not a route which should be taken without good experience of walking in the mountains and scrambling, as some parts will need both hands and feet. Proper walking boots are a must, with at least one death being caused by a person wearing trainers when the rocks were wet There is often a queue of people waiting to cross the ridge. Do not feel pressured into taking it faster than you feel comfortable with. Mountain Rescue get called out too often to people who become cragfast (too scared to move) on Crib Goch. Be sensible - if you don't like heights or have no experience of this kind of scramble do not attempt this route. Check the weather before you start off - in rain the rocks become slippery, and in mist or low cloud the ridge can feel even more precarious. Trying to traverse the ridge in high winds is also foolhardy. Don't attempt the ridge in winter unless you are very experienced, are equipped with ice axes and crampons and know how to use them! In summer take sun screen with you, and lots of water. A woman fell 100 ft (but was lucky and survived with broken bones) after succumbing to heat exhaustion on Crib Goch.